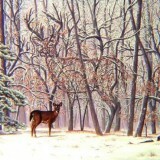 Donald “Rusty” Rust is an American painter focusing primarily on wildlife scenes and portraits. 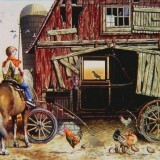 Some of his works also feature illusionary elements involving hidden objects or other deceptive techniques. His work is featured in a number of prestigious collections including the Smithsonian’s National Portrait Gallery and the Norman Rockwell Museum in Philadelphia, PA. Rusty has produced more than 15,000 paintings over his illustrious career. 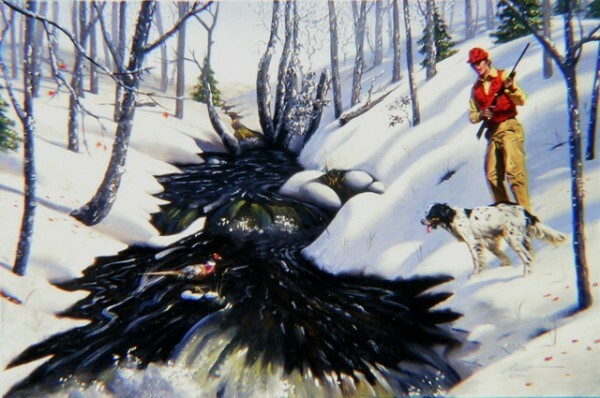 In his painting below titled “Two Birds With One Stone”, a hunter and his dog spot a bird perched on a snowy rock in a creek. Can you find the second bird hidden in this scene?